NOTE: Shipping for the products on this page are included in the price. However, orders with multiple products from this website may incur additional shipping charges. In that case, you will receive an additional shipping invoice which must be paid before your order ships. To ensure delivery, all international orders are shipped USPS Global Priority. Carol Croft orgonite products, specialty orgonite, gemstone pendants and more are available at www.crystalinsights.net. The Harmonic Protector© acts as an ‘energetic mirror.’ It reinforces your body’s natural energy field (aura), while also helping you cope with energy overload and stress. 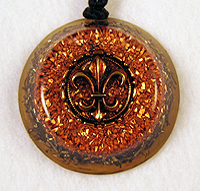 The gemstones in the pendant were chosen to enhance the body’s own etheric (auric) field. Along with the titanium in the resin/metal mix the strengthened etheric field acts to shield against strong electromagnetic fields and debilitating frequencies. The Harmonic Protector© enhances mental and emotional clarity, awareness, a sense of well-being, restful sleep and dream clarity, though of course these are all effects of healing and strengthening the etheric field. The coil in the Harmonic Protector is designed to allow energy to come into the aura long enough for the body to recognize whether it is of the Light or not. It comes in clockwise and in the center the coild turns on itself and the energy goes out counter-clockwise to block and expel negative energy. If the energy coming in is of the Light, the pendant allows the energy to stay in your space. This coil pattern can be found in the walls of New Grange, Ireland, and can be found in Celtic tradition dating back to 3000 B.C. Why does the Harmonic Protector make me uncomfortable? I’ve had a few people ask this question. The reason The Harmonic Protector might make someone uncomfortable when wearing it is that they are trying not to move forward with their spiritual evolution. The gemstones in the pendant protect us from EMF but that just scratches the surface of what the pendant can do. I didn’t realize this until I wore the pendant for a while. Then I started hearing the same thing from my psychic friends, whom I had gifted them to for their feedback. The specific gemstones in the pendant can force us to move forward. For some people that is a scary and uncomfortable thought. People sometimes really like the 4-walled box they live in. They feel very protected there. But if they only knew what they could experience if they would move forward on their own personal spiritual path. We were, each one of us, put here for a reason; wouldn’t it be nice to know what that reason is? You can only bury your head in the sand for so long. Then you are forced to move forward because of some traumatic event in your life. The Harmonic Protector will gently nudge you to move forward. As you move forward it will protect you so as you go through this change you won’t have a traumatic time of it. The Pendant will take the edge off the experience so that you can learn what you need to from the experience, in a good way. When people email with this concern, I ask them to be patient and stay open to the possibilities. The Mary Magdelene Harmonic Protector© is formulated with a special mix of stones that open you up to the new frequencies that are emerging on the planet. More heart-related than the traditional HP, the MM HP opens the heart more. It’s different in that it works solely on heart level, and with unconditional love issues, where the traditional HP is very broad protection. This is the next level of spiritual development. The Crystal Harmonizer, or as my husband, Don, calls them: “St. Buster’s Button”, is a therapeutic device for use on the body. The Crystal Harmonizer can clear the chakras in a matter of minutes. They will also clear any energy blockages in the body. If you have aches or pains, put the Crystal Harmonizer on the area, base down against the skin, after 10-20 minutes the pain should subside. These devices have an elaborate coil of copper wire strung with different gemstones for each of the Chakras/Energy Centers of the body. 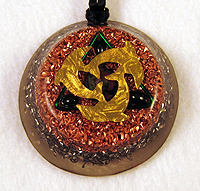 This coil is then suspended in a matrix of copper, titanium, and resin creating the Orgone/Chi/Life Force. At the base, is a north facing neodymium magnet. These are wonderful tools for personal use or for use in your practice. Dimensions: 2 3/4″ across the base, 2 1/4″ high. The Orgone Pyramid is a wonderful device! I designed these mainly for the home or office. It will absorb all negative, unbalanced energy that may come into your space — transforming it into positive, balanced energy. For instance, if someone were to come into your home who is extremely distraught, you could sit them down next to the Orgone Pyramid or hand it to them to hold, don’t tell them what it is, simply ask them to hold it. Then watch, you will be able to see their distress and anxiety melt away. 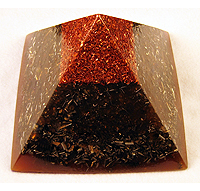 For energy workers and massage therapists, the Orgone Pyramid can be a wonderful addition to your bodywork area. Simply place it under the client (chair or massage table) and you’ll notice that they will respond more effectively to your treatments. For parents, if your child is prone to nightmares, place the Orgone Pyramid on a bedside table or underneath the bed … and the nightmares will end. Each Orgone Pyramid has a Lemurian Seed Crystal in the point with a clockwise coil and several positive gemstones. 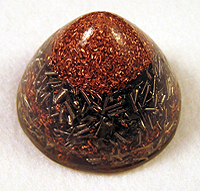 At the base, the Orgone Pyramid has 4 additional crystals which point in each direction. Dimensions: 6 1/2″ X 6 1/2″ at the base, 4 1/2″ at the point. As these are handmade, the dimensions may vary slightly.